Now it would seem that Ryan Williams, Putnam County’s representative in the Tennessee state house, and state senator Frank Niceley of Strawberry Plains want to turn back the clock. They’ve introduced bills in the legislature that would, in effect, put the power to determine who represents Tennessee in the U.S. Senate back in the hands of the General Assembly. 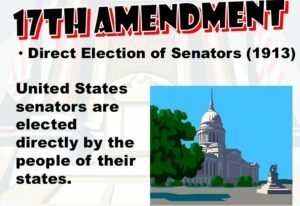 House Bill 21 and Senate Bill 0027 would do away with primary elections for U.S. Senators. Instead of voters choosing the candidates, Republicans in the General Assembly would caucus and select the Republican candidate. Democrats in the General Assembly would do likewise. Then, in the general election, voters would decide which of these two candidates (and any independent candidates who qualified) to send to Washington, D.C. In a state like Tennessee where one party—the Republicans—is so overwhelmingly dominant, the power to select our U.S. Senator would be handed to the Republican members of the General Assembly. In the years before the 17th Amendment was adopted, corruption in state legislatures was rampant. Money talked. Decisions were made in smoke-filled rooms. U.S. Senators were often puppets of a handful of powerful people in each state. Why do we think things would be any less corrupt in the twenty-first century? Is that really what we want? In Tennessee, voters don’t declare a party when registering to vote and are therefore allowed to cast their ballot in whichever primary they choose. That’s a good thing in a state where one party dominates. Knowing that the Republican candidate is almost certain to win the general election, some Democrats “jump ship” and vote in the Republican primary so they can at least have a voice in who Tennessee sends to the U.S. Senate. That’s understandable. While there’s sometimes small choice in rotten apples, it’s better than having no choice at all. Primaries are messy. They’re expensive. They’re annoying. Who among us hasn’t given the T.V. mute button a workout or turned off the car radio to silence political commercials? Yet primary elections are a vital part of our political process. They’re what grassroots democracy is all about. I’m not willing to hand that power back to 99 members of the General Assembly. If you’re not either, let those who represent you know that you’re not. The sooner, the better. Next week, I’ll delve into some of the other troubling things Mr. Williams had to say.